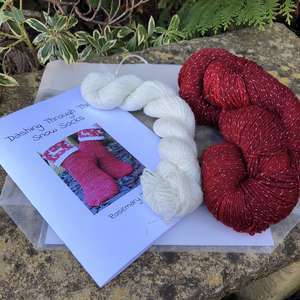 The yarn can either be sent in a skein or caked ready to knit , just pop me a message which you prefer. This pattern was written to showcase a new yarn base , the extra sparkle reminds me of snow glistening in the winter sun. These socks are worked top down , they have a fold over cuff, which will keep your ankles warm on cold days . The pattern has been professionally printed on good quality card and paper .